~ My Harry Potter movie marathon party. Get ideas for decorations, food and Harry Potter related fun!! As I stated before, there was barely a part of my house that wasn’t touched with some special Harry Potter decoration, the bathroom included! 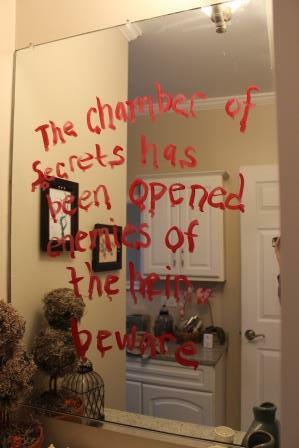 The theme in the bathroom was Moaning Myrtle & the Chamber of Secrets. I printed some pictures of her on Vellum paper and attached them to the mirror. It would have been creepier if I had reversed the image so she was actually looking to the right instead of the left…she would have been watching you go to the bathroom then…hee hee hee. Printing her on vellum paper, which is slightly see through allowed the light to reflect through her on the mirror behind her. It gave it a more ghostly effect! 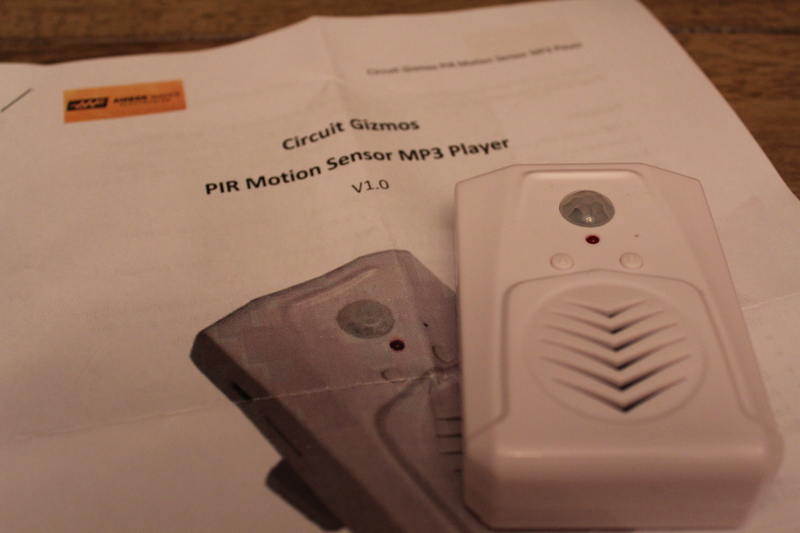 I also had this motion activated sound player with a bunch of Moaning Myrtle sound clips on it. 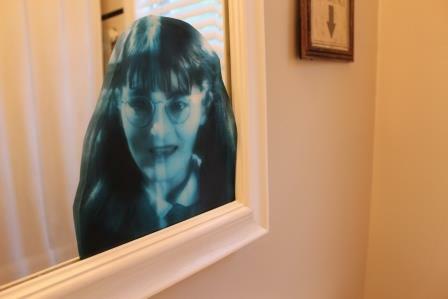 Every time someone went to the bathroom Moaning Myrtle talked to them. I’m not sure the guests appreciated this effect as much as I originally thought they would. I found the player on Amazon. You can record 10 individual clips or 1 clip up to 2 minutes and transfer them to the player using a micro SD card. I actually used an app on my phone called Pocket Wav Pad and just recorded and edited the Moaning Myrtle sound files from the various movies on there, then emailed the wav files to myself. My husband found a handy program online that allowed you to string all the sound files together into one. Moaning Myrtle literally talked to you the entire time you were in the bathroom! Ok…it did get kind of annoying after a while. 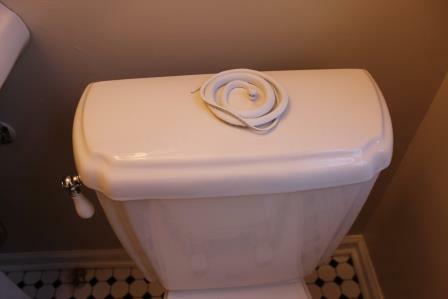 But it also had the unintended benefit of letting you know when the bathroom was occupied, so you didn’t go upstairs and have to wait for the bathroom! I also pulled in some decoration ideas from the Chamber of Secrets. 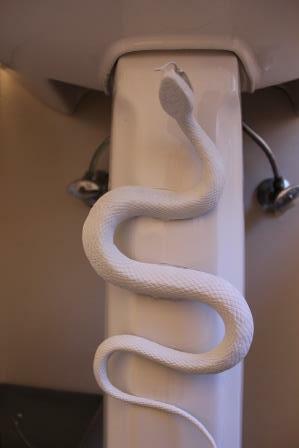 The bathroom fixtures were enhanced with some rubber snakes from the dollar store that I spray painted glossy white and hot glued to the sink and toilet so they looked as if they were actually part of the fixture. Attaching things with hot glue was the best way to get the stuff to stick to ceramic. 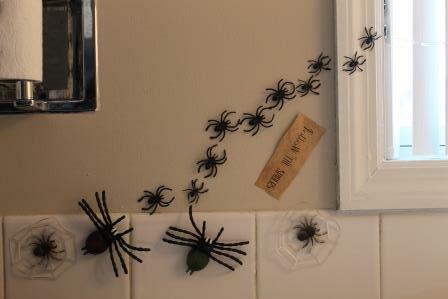 And when the party was done, they just popped right off without damage to the fixtures or tile (see spiders below). There was a cryptic message painted on one of the bathroom mirrors. I just used acrylic (washable) red craft paint. And let’s not forget that Spiders flee from the Basilisk, so I have some spiders escaping out the window, and a quote from Hagrid – “follow the spiders”! 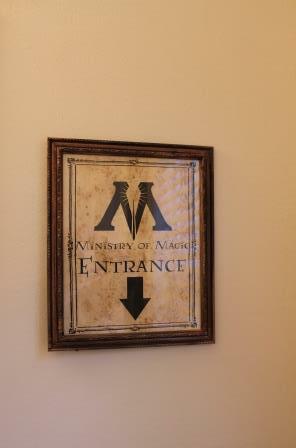 An just for fun…I had to include this Ministry of magic sign…even if it didn’t exactly go with the whole chamber of secrets theme. I found the file on the web. I took out the part that said “Ladies” at the bottom and replaced that with an arrow. I then printed the file, aged it with my paper aging technique, and put it into one of my dollar store picture frames. Then hung it above the toilet! Questions about my party? Feel free to contact me!